Distinct cellular subtypes in dense tumor-enveloping stroma may be precisely targeted to improve treatment response in pancreatic cancer. Cold Spring Harbor, NY — Researchers have moved an important step closer to understanding why pancreatic cancer is so hard to treat. With a median survival of only 6 months and a 5-year survival rate of about 8%, patients tend to be diagnosed when the disease has already spread to other parts of the body—this is one part of the problem. Another is that when treated with existing chemotherapy drugs, patients tend to benefit only slightly or not at all. Why are pancreatic tumors so resistant to treatment? One reason is that the “wound”-like tissue that surrounds the tumors, called stroma, is much more dense than stromal tissue surrounding other, more treatable tumor types. Stromal tissue is believed to contain factors that aid tumor survival and growth. Importantly, in pancreatic cancer, its density is thought to be a factor in preventing cancer-killing drugs from reaching the tumor. 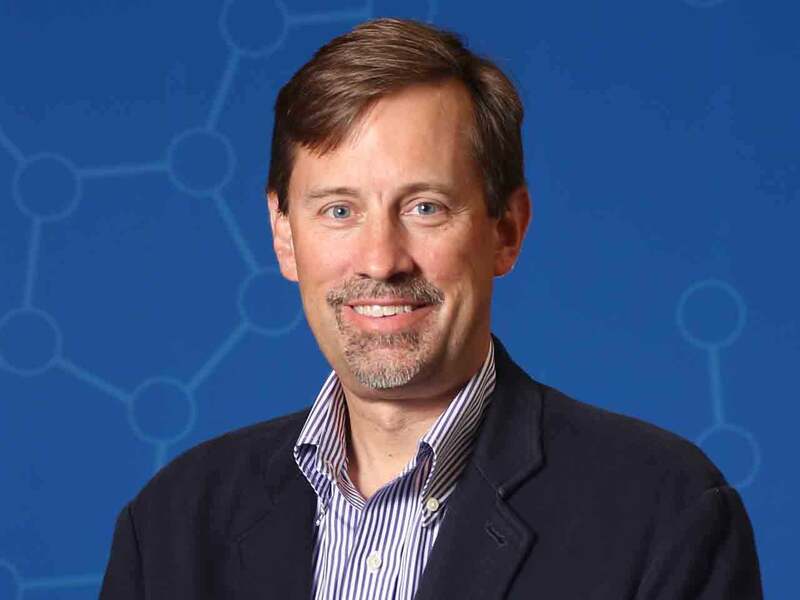 “You can think of a pancreas tumor as a big raisin oatmeal cookie, with the raisins representing the cancer cells and oatmeal portion representing the dense stroma that makes up over 90% of the tumor,” says David Tuveson, M.D., Ph.D., Director of the Cancer Center at Cold Spring Harbor Laboratory (CSHL). Tuveson leads the Lustgarten Foundation Designated Lab in Pancreatic Cancer Research at CSHL, and his team today reports an important discovery about stromal tissue in the major form of pancreatic cancer, called pancreatic ductal adenocarcinoma, or PDA. Tuveson, who is also Director of Research for the Lustgarten Foundation, wants to know more about stromal tissue in PDA. “We were interested to read the results obtained by researchers in other labs, who targeted the stroma in various ways, sometimes with encouraging results, but sometimes causing tumors to grow even faster” he explains. “These conflicting results suggested to us that we still did not know enough about the stroma,” says Daniel Öhlund, M.D., Ph.D., co-first author with graduate student Abram Handly-Santana, postdoc Giulia Biffi Ph.D., and postdoc Ela Elyada Ph.D., of the team’s paper, published online today in the Journal of Experimental Medicine. Stroma in PDA becomes what scientists call “desmoplastic.” Its dense, fibrous texture which presents a formidable barrier surrounding a tumor consists of structure-providing connective tissue; cells called fibroblasts which produce the main part of this connective tissue; and a plethora of immune cell types drawn to the tumor site as well as cells that form blood vessels, which bring nutrients to the tumor. Tuveson’s team capitalized on a technology he and colleagues co-developed with scientists Sylvia Fernandez-Boj and Hans Clevers several years ago: the ability to grow cultures of pancreatic tumors—sampled from people and mice—that develop in a 3-dimensional medium. Called pancreatic organoids, these small spheres mimic the biology of the tumor samples from which they are derived, and thus are a valuable aid for researchers trying to learn more about tumor biology and testing new combinations of treatments on them. In the experiments reported today, organoid technology is taken to a new level, in which organoids derived from tumors are for the first time “co-cultured” with one component of the stroma in which actual tumors grow. The result is a more realistic rendering of what happens in the pancreas of cancer patients—and yet, in a stripped-down, simplified way, such that the effect of adding a single new factor, in this case from stroma, can be clearly parsed. 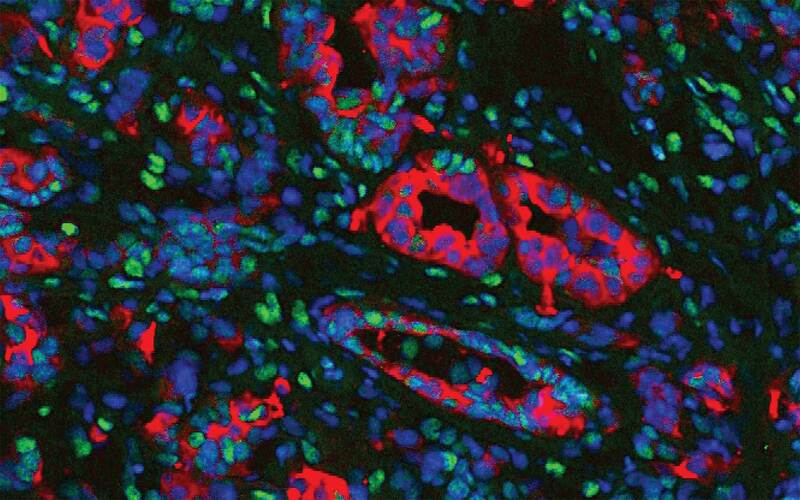 In the dense stromal tissue that envelops pancreatic tumors, Tuveson and colleagues have discovered two varieties of a cell type called fibroblasts which help create the stroma. One of these varieties is seen in left image: fibroblasts (red) close to proliferating cancer cells (green) that express high levels of a protein called αSMA. In the image at right, red color indicates the presence of the immune-signaling molecule IL6, which a second subclass of tumor-related fibroblasts secretes. These fibroblasts do not express αSMA, and tend to be farther from the tumor. These images, from pancreatic organoids grown in 3D culture, recapitulate the same heterogeneity in tumor-associated fibroblasts first seen by the team in samples derived from people with pancreatic tumors. Selectively targeting fibroblast subtypes may increase the ability of currently available chemotherapy drugs to reach and reduce pancreatic tumors. Fibroblasts form part of the stroma and are typically non-cancerous, but contribute to the cancer’s development by secreting, among other factors, structure-providing molecules to the stroma. But that is only one of their functions. Experiments led by Öhlund and team in human- and mouse tumor-derived organoids, demonstrated something not previously known: fibroblasts come in at least two varieties in PDA, and possibly more. This discovery of heterogeneity in the fibroblast portion of the stroma in pancreatic cancer opens up the field to a host of new possibilities. One subtype of fibroblast noted by Tuveson’s team was distinguished by its production of high levels of a protein called alpha smooth muscle actin, or αSMA. Öhlund discovered that the fibroblasts producing αSMA were immediately adjacent to neoplastic tumor cells in human and mouse tumor tissue. This result was subsequently observed in PDA organoids grown as co-cultures with fibroblasts. Furthermore, the team noticed that this co-culture resulted in the formation of desmoplastic stroma—the dense, material that confounds treatment in human patients today. “The traditional view of the tumor stroma as a uniformly pro-tumorigenic niche needs reconsideration since certain fibroblasts subtypes might have pro-tumorigenic properties while others might have anti-tumorigenic properties. Therapeutic development must consider this possibility,” Tuveson summarizes. The research described here was supported by the Cold Spring Harbor Cancer Center Support Grant; the National Cancer Institute; The Lustgarten Foundation; Cold Spring Harbor Laboratory Association, the NIH (5P30CA45508-26, 5P50CA101955-07, 1U10CA180944-02, 5U01CA168409-5, and 1R01CA190092-03). The investigators are also grateful for support from: Stand Up to Cancer; the STARR foundation (I7-A718); DOD (W81XWH-13-PRCRP-IA); the Pecision Medicine Research Associates; the Swedish Research Council (537-2013-7277), the Kempe Foundations (JCK-1301) and the Swedish Society of Medicine (SLS-326921, SLS-250831, SLS-175991, SLS-591551), federal funds through the county council of Västerbotten (ALFVLL269081, VLL242121,VLL322391, VLL400421, VLL493371, VLL582681); the Cancer Research Foundation in Northern Sweden (AMP15-793, LP11-1927 for D.Ö. ); the Human Frontiers Science Program (LT000403/2014; LT000195/2015-L; LT000190/2013); The Weizmann Institute of Science Women in Science award;, EMBO (ALTF 1203-2014); the Italian Ministry of Health (FIRB – RBAP10AHJ); Associazione Italiana Ricerca Cancro (AIRC n. 18718), NIH (R50CA311506-01); NIH awards (CA101955 UAB/UMN SPORE, 5T32CA148056, and F32CA192904), the Damon Runyon Cancer Research Foundation (Shirley Stein fellow, DRG-2165-13), the National Cancer Institute (NCI 1K99CA204725-01A1), and Nancy Gay fellowship.